The Interior Gallery is a Design and Import Company bringing elegant, high-quality products at competitively low prices. Our entire selection of bathroom toilets offer a dual flush component for water saving usage. The dual flush toilets feature a sleek design in white porcelain. These dual flush siphonic toilets also offer an S-trap design. The Interior Gallery offers a wide variety of modern toilets to fit all your bathroom design needs. Dual flush toilets are the newest and most sought out pieces for modern bathroom designs. 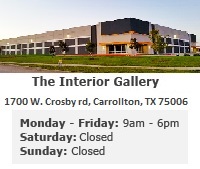 Since The Interior Gallery is truly a factory direct company, we do not purchase from any sellers in between. This ensures that you will receive the best price possible. Moriano - Modern Bathroom Toilet 28.3"
Nasino Modern Bathroom Toilet 25.6"
Palmiro - Modern Bathroom Toilet 26.6"
Patricio - Modern Bathroom Toilet 26.2"
Our range of elegantly designed bathroom toilets include one piece dual flush and two piece dual flush modern toilet models. Our modern toilets or contemporary toilets are designed with the latest in luxury modern bathroom trend in mind so they are comfortable yet functional. Our ultra-modern one piece toilet and two piece bathroom toilet designs are not only pleasant to look at but also house contemporary functionality. These features include a sophisticated water-saving dual flush system and S-Trap design. Be sure to browse our beautiful selection of intelligently designed and well crafted modern bathroom toilets. We have over 70 elegant designs for you to choose from. We are sure you'll find a modern toilet design to suite your fancy. You'll also find that even though our prices are very competitive, our discount toilets quality remains exemplary. So you can be rest assured you'll be getting a product which is well worth your investment.